Last week the almost forgotten war in Afghanistan was once more back in the headlines after two U.S. soldiers were killed in combat. The incident took place in the northern city of Konduz, which in recent months has become a hotbed of Taliban activity. The operation was a joint U.S. and Afghan security forces raid, targeting a couple of senior Taliban commanders. Things somehow went horribly wrong and the U.S.-Afghan army patrol found itself ambushed by a larger Taliban force. In order to extricate themselves from the firefight, the American soldiers called in heavy airstrikes. 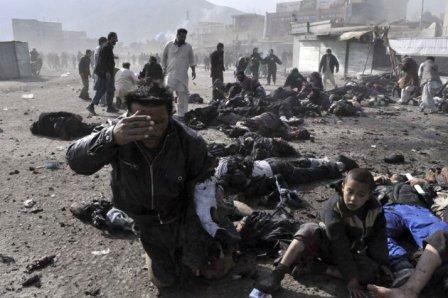 Given that Konduz is a congested urban centre, the allied airstrikes killed at least 30 Afghan civilians, many of them women and children, and dozens more innocent bystanders were severely wounded. Once the combat subsided, the shocked and outraged citizens of Konduz gathered up at least a dozen of the bloodied corpses and carried them to the local governor’s office to protest the Americans’ indiscriminate use of lethal force against civilian targets. The U.S. media focus was not on the collateral damage created by the allied airstrikes, but rather highlighted the two dead and four wounded American soldiers caught in the ambush. In a statement to the press, U.S. Secretary of Defense Ash Carter claimed “Our service members were doing their part to help Afghans secure their own country while protecting our homeland from those who would do us harm.” And boom, there it is. The same myth that the tub-thumping Colonel Blimps used in Canada to morally justify our soldiers killing and being killed during the 12 years that we had troops deployed in Afghanistan. Carter claims to be helping the Afghans, but one has to ask, which Afghans? The Taliban followers are not aliens; they are Afghans. They controlled most of Afghanistan when the U.S. invaded in 2001, and despite the hundreds of thousands of NATO troops employed, the countless billions of dollars spent and the endless hours spent training an Afghan security force, the Taliban still controls an estimated one-third of the country. Were it not for the continued presence of 8,400 U.S. troops and the allied air armada’s constant vigil, the Taliban would very quickly depose the hated regime the west installed in Kabul. Afghans may not all love the Taliban, but President Ashraf Ghani and his co-ruler chief executive Abdullah Abdullah are loathed by their citizenry. Having American warplanes blast apart innocent civilians in order to prop up the Kabul regime only intensifies the hatred. Canadians in Afghanistan suffered 158 soldiers killed and another 2,000 wounded or injured, not including those suffering from unseen mental scars. During the dozen years our soldiers engaged in combat, they too were fighting and killing Afghans who opposed the corrupt cabal of crooks that the U.S.-led alliance installed in Kabul. Carter’s second statement about fighting the enemy in Afghanistan to keep the homeland safe is also a very misleading whopper. The Taliban have never attacked targets outside of their territory in Afghanistan and Pakistan. No Afghan to date has been involved in any actual attack, or associated with any terror plot in North America. No Taliban leader has vowed to unleash death and destruction upon the West in retaliation for our military intervention against them. Truth be told, most of the Taliban’s illiterate loyal followers couldn’t find North America on a map. As for the al-Qaeda evildoers the Americans originally sought to eliminate following the 9-11 attacks, well, that cancer not only spread like wildfire, it has morphed into the even more sinister Daesh. Before the Canadian government goes running off to commit soldiers to another no-hoper UN peacekeeping mission somewhere in Africa, we should commission a full-fledged inquiry into how and why we failed so miserably in Afghanistan. Of course that will not happen anytime soon, as the Americans keep telling us that they had to kill innocent Afghans in order to save Afghans. Oh yeah, and to keep us safe here at home, from Afghans who have, in fact, never actually done us any harm on our own soil.